How many action heroes pick their nose? I mean really getting in there and digging? Just one: Jackie Chan in Yuen Woo-Ping's Snake in the Eagle's Shadow. He plays Chien Fu, a simple-minded menial worker at a dojo, who is, in the words of a neighbor, "a walking target." Meanwhile there is a plot afoot by the members of the "Eagle Claw" clan to kill everyone who knows the "Snake Fist," and Chien Fu unknowingly befriends an old beggar (Yuen Siu-Tien) who is the last practitioner of the Snake Fist. Upset that the beggar is sleeping in front of their building, several youths set upon him and Chien Fu comes to his rescue. Instead it's the old man who, behind Chien, manipulates him, much as a puppeteer manipulates a puppet, so that it appears that Chien has won the battle. When the old man learns how Chien is picked on, he teaches him escape techniques. Later, when Chien saves the old man's life, he teaches him the Snake Fist. Sure there are the schlocky villains here with roundhouse punches, and battles on nondescript hilltops overlooking Hong Kong harbor, and background music like the sound of a pinball machine. But this is early Jackie and he goes all out. This beggar, by the way, is the same actor who plays the Drunken Master, and we get similar scenes of tortuous training: Chien in pushup mode, over hot incense sticks, balancing on his fingertips. There is even a scene straight out of Painted Faces, the 1988 film based on Jackie Chan's Peking Opera upbringing: the old man takes Chien over his knee and bends him backward, stretching out the stomach and back muscles. This position later comes in handy during the final battle between the Snake Fist and the Eagle Claw. Chien avoids a punch by bending over backward and crawling away like a crab. Remarkable. But in order to win, Chien develops his own fighting technique based on how a cat defends itself against a snake. This scene is necessary in a certain sense. How else to justify Chien beating the Eagle Claw villain when the old beggar, the Master of the Snake Fist, could not? But the scene doesn't work logically. Yes, a cat can beat a snake. How does that help against an eagle? The Eagle Claw Clan is preying upon the Snake Fist Clan because eagles prey upon snakes. But what preys upon eagles? Certainly not cats. The scene also doesn't work visually. Jackie crouching in cat-mode, hissing, and then springing, inspires laughter more than awe. Still, this movie is fun from beginning to end. 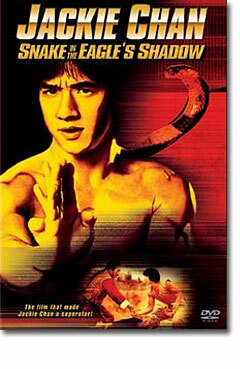 A must-see not only for martial arts fans but anyone who digs physical grace.